If you know anything about me, or even if you only know me from what I've written in the past, you know I am a colossal theater geek. I started performing at 7, writing my own terrible plays at 9, hiding out in tiny, dirty black box theaters at 13 and emerged from them at 22 only to run screaming back to tinier, dirtier, 'neath-a-grocery store comedy theaters at 23. I belong to a New York-based theater group that I'm either performing with or watching perform, and any sort of Broadway-related category on Jeopardy! sends me into a pulsating tizzy. So I deemed it fitting to start this new year of new things with a new thing centered on an old thing. 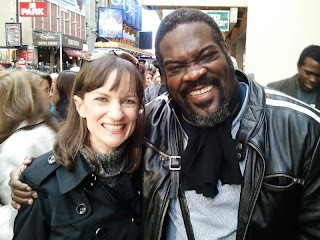 For an early birthday celebration, Husband and I saw the fantastic "Porgy and Bess" on Broadway, and I stood at the stage door to meet the cast and had my picture taken with one of the leads. Sure, it helps if your husband went to college with said lead, in this case the phenomenal Phillip Boykin, who played the villainous Crown (and should be a shoo-in for a Tony nomination). He was incredibly generous with his time, catching up with us and posing for photos amid a sidewalk full of autograph seekers. We unfortunately missed David Alan Grier, Norm Lewis and the stunning Audra McDonald (well on her way to Tony #5 for this one), but since this was only my first photo-by-the-stage-door experience, I'll just assume that I'm destined to meet them in the future. If not at the stage door, then definitely at the first rehearsal for a revival production of one of those plays I wrote when I was 9.